When ocean freight services will not get your freight to its destination in time due to a short lead or manufacturing schedule, airfreight is the fastest way to transport your product around the country or around the world. 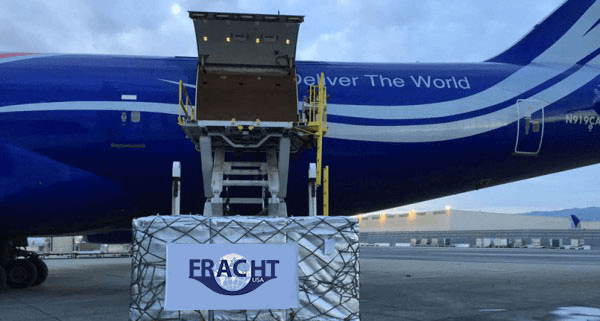 Fracht’s air cargo division is well equipped with approximately 300 airport offices, in over 70 countries, we offer a complete line of domestic and international air services that keep you in total control of your cargo from pickup to delivery. With our strategically placed gateways, we are able to offer competitive rates on import and export consolidated airfreight services as well as hazardous, express and courier options. If you require a direct flight, transshipment via another airport or country, or even a charter, Fracht’s staff are known for their extensive experience and will help you choose the most appropriate airfreight service for your needs. Fracht’s consolidation service via our HUB’s offers a non direct service saving the customer on our direct flight options. Your freight will be sent to one of our key gateways where it is consolidated with other freight. It will be then flown to a gateway situated in that destination country and then on-forwarded to its final destination. Usual transit times are between 4 – 6 days. With contracts and rate agreements with all the major airlines around the world, Fracht is able to offer express and guaranteed services for your just in time / urgent shipments. Your freight will be sent on a scheduled and where possible, direct flight to ensure the fastest possible solution to your delivery needs. With the relationships that Fracht has worldwide with the operators of the freighter aircraft, we don’t have to use freighter brokers, allowing for your charter requirements. From a Falcon F20 aircraft for 100 kilos, to the Antanov AN225 for 250,000 kilos, Fracht offers you a complete solution. Fracht will advise on load planning, packing and supply confirmation of delivery upon arrival. Our staff will also supervise the loading and unloading at origin and destination. Fracht’s offices worldwide have experienced staff that can provide global hand carry services anytime anywhere. We guarantee a prompt and safe arrival of your international or domestic hand-carry shipments. Our international staff already have visas and passports in place for countries that are traditionally very difficult to access. If you are not familiar with the Known Shipper concept HERE is our Q&A that should help. IS AIR FREIGHT AN OPTION FOR YOU? FIND OUT.